The Dawson Creek Subdivision of the British Columbia Railway is located in northeastern British Columbia. It diverges from the mainline at Chetwynd, a divisional point between the Chetwynd and Fort St. John Subdivisions, and extends eastward to the town of Dawson Creek near the Alberta border. Most of the subdivision lies within the fertile south Peace country, which specializes in grain and forage seed agriculture. The Chetwynd Yard includes a passing track, four classification tracks, two diesel servicing tracks, a rip track, a trailer ramp, and the station and freight shed. There is also a small mechanical shop and fuel pumphouse next to the servicing tracks. Online industries within the yard limits in 1977 included the Canfor sawmill, Imperial Oil, and the B.C. Development Corporation. B.C. Hydro & Power Authority maintains a pole yard, which was also used for the trans-shipment of heavy machinery to the hydro-electric dam site at Hudson's Hope. West Fraser Mills operates a lumber mill situated on the mainline immediately north of town. Located towards the north end of the Chetwynd yard is the wye which also forms the junction with the Dawson Creek Subdivision. From here the tracks climb a stiff 2.2 per cent grade for several miles, reaching the first passing siding at Wabi (Mile 8.0). The section between Mile 12.0 and Mile 13.0 requires cautious running due to excessive curvature. The line then begins a 2.2 per cent descent towards the East Pine River, passing a siding and pit track at Sundance (Mile 12). At Mile 16.25 the tracks pass over the Highway 97 (Hart Highway) on a concrete rigid frame ballasted deck span built in 1957. The bridge measures 142 feet in length and stands 22 feet high. 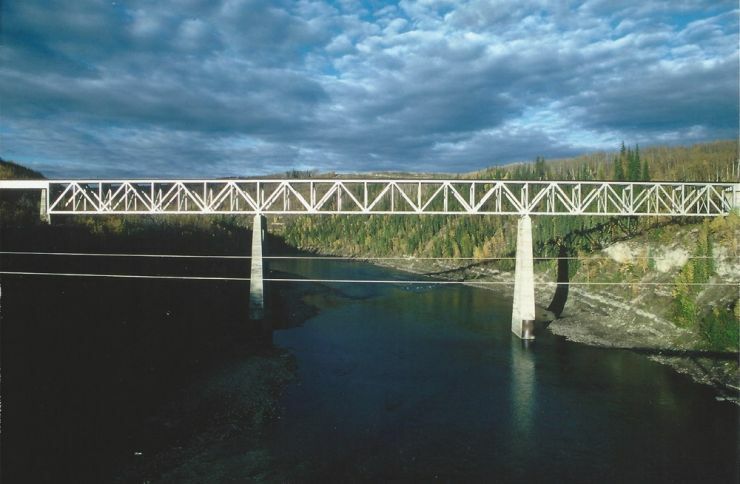 The scenic highlight of the entire subdivision is the continuous deck truss and plate girder bridge spanning the East Pine River at Mile 16.68. Built in 1957, the bridge comprises three continuous deck trusses on four concrete piers with a deck plate girder span at either end. The overall length of the bridge is 1,013 feet and the rails are 163 feet above the river. After crossing the Pine River, the line begins a winding six mile climb on a 2.2 per cent grade , reaching the South Peace plateau at Foss siding (Mile 22.75). From here the grades are less severe as the tracks roll through the fertile wheat fields of the south Peace. Tremblay siding is reached at Mile 33.75. In 1977 the Alberta Wheat Pool's Groundbirch elevator was still served by the railway. On any given day, several forty foot boxcars could be spotted here waiting to be loaded with grain from nearby fields. From Tremblay the railway continues through gentle farm country. At Mile 46.09 the line crosses the Kiskatinaw River on a timber bridge built in 1958. The bridge measures 458 feet in length and consists of a 150 foot Howe truss with frame trestle approaches at either end. The overall height of the structure is 60 feet above the river. This bridge remains in service today. The tracks then climb for several miles through Kiskatinaw until Mile 51, whereupon its descends through rich farmland all the way into the town of Dawson Creek. Just before entering town, the creek from which the town takes its name is crossed on a series of three pre-stressed concrete box girder spans placed in 1974. Each bridge measures 25 feet in length and stands ten feet high. The line enters Dawson Creek on the east leg of the wye, the tail of which led to the Northwest Wood Preservers planer mill and wood pressure treatment plant. In 1977 the yard comprised three classification tracks and an industrial lead serving the various grain elevators. From west to east these included the Alberta Wheat Pool No. 3 elevator, the Western Agri-Service elevator, Fosters Seed & Feed, and Cargill's grain elevator, fertilizer blending plant, and seed elevator. At the west end of the yard in front of the Alberta Wheat Pool elevator, the railway maintained a two track trailer ramp. The station and freight shed were situated at the east end of the yard. From there the line heads east towards a three track interchange yard with the Northern Alberta Railways. The Peace River region of northeast British Columbia attracted the interest of railway promoters at an early date. The region offered the lowest grades across the Rocky Mountains, and its soils were not only rich in minerals, oil and natural gas, but yielded a fine grade of wheat. The completion of the Northern Alberta Railways from Hythe, Alberta into Dawson Creek encouraged further settlement in the area, and provided farmers in the South Peace region with a direct route to Edmonton for their products. This increased speculation that the Pacific Great Eastern Railway might also be extended into the region. The first PGE passenger train arrived in Prince George on November 1, 1952 and plans were soon underway to extend the line northwards into the Peace River region. The first contracts for construction were let in March 1955 and the rails reached Chetwynd three years later in February 1958. From Chetwynd the main line would continue north to Fort St. John, and a branch line would diverge and run east to Dawson Creek and a connection with the NAR. Tracks were laid into Dawson Creek on October 1, 1958 and on the next day three official trains were operated over the branch. The first inaugural train was powered by brand new RS-18s Nos. 590 and 589, and the consist included coaches borrowed from the CNR, CPR, Great Northern, Milwaukee Road, Northern Pacific and Union Pacific. The PGE's steam generator car was coupled behind the locomotives, and at the rear of the consist, the PGE official car Northern Summit carried the markers. From the outset, the railway offered daily RDC passenger service from Prince George to Chetwynd, and tri-weekly service from Chetwynd to Fort St. John and Dawson Creek. However, this service was not well-patronized and was discontinued in May 1962. There was little freight traffic at first. A single MLW RS-3 was usually retained at Chetwynd to power occasional freight trains over the branch. The railway erected a station and freight shed at the north end of the yard in Dawson Creek, and built a stock yard adjacent to the wye at the south end of the yard. Later, a trailer ramp was also built. The first online industries at Dawson Creek arrived in 1965. A food warehouse and cement unloader were placed in operation during that year, and the first grain elevator in Dawson Creek to be served by the PGE was completed in 1966. This was the Alberta Wheat Pool No. 3 elevator situated at the south end of the yard. During 1965-1967 National Grain completed an integrated grain elevator, seed plant, fertilizer storage facility and farm retail outlet towards the north end of the yard. In 1968 Northwest Wood Preservers opened a wood pressure treatment plant which was served via a spur leading from the tail of the wye. The adjacent planer mill was completed in 1969. In the same year, the Alberta Wheat Pool erected a grain elevator at Groundbirch. This was destined to be the only intermediate online industry along the branch line until 1991. 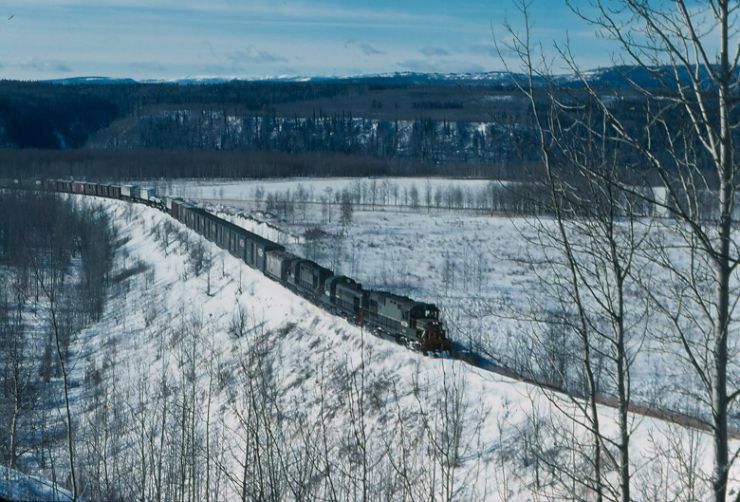 By the 1970s, the British Columbia Railway was operating a regularly scheduled freight train from Chetwynd to Dawson Creek and return three times a week. The usual power was one or two MLW RS-3, RS-10 or RS-18 locomotives. The train hauled trailers, lumber and wood chips from the planer mill, and grain from the various elevators. During the decade, an alfafa cubing plant commenced operation at Dawson Creek, and Cargill Ltd. bought out National Grain, assuming control of its facilities including those at Dawson Creek. In addition, pipe receiving and storage yards were set up at Chetwynd and Dawson Creek for construction of the Grizzly Valley pipe line. On two occasions during the 1970s, the Dawson Creek Subdivision received special visitors in the form of live working steam locomotives. On August 2, 1975 ex-CPR Consolidation No. 3716 hauled the British Columbia Provincial Museum train from Chetwynd to Dawson Creek. The train included two flatcars with live steam equipment, a power car, three display coaches, and the BCR official car Northern Summit which was renamed Peace River for the occasion. The train remained on display at Dawson Creek until August 4, whereupon it returned to Chetwynd. On April 28, 1979 ex-CPR Royal Hudson No. 2860 visited the branch with a special tourism train. The consist included cars from the Provincial Museum fleet as well as the Royal Hudson excursion train set. By 1980 the Northwest Wood Preservers planer mill and treatment plant had ceased operations. During the next few years, several grain elevators changed hands. The Western Agri-Service complex was sold to Pioneer, and Fosters Seed & Feed plant was acquired by United Grain Growers. In 1981 the Northern Alberta Railways was acquired wholly by CN. Two significant events occurred durng the mid-1980s. In 1985 BC Rail lobbied successfully for inclusion in the Western Grain Transportation Act, which finally allowed the railway to ship grain from the Peace region at favourable rates. During 1987 Louisiana Pacific completed a new oriented strand board (OSB) plant on the site of the old planer mill and treatment plant, and this added significantly to carloadings on the branch. By the mid 1990s, trains ran four days per week and were longer in length, requiring three or four M-420 units on a regular basis. In 1991 Louisiana Pacific opened a new pulp mill near Chetwynd, and BC Rail constructed a 14,760 foot long spur line to the mill from Perry at Mile 10.0 of the Dawson Creek Subdivision. The railway implemented a Perry Turn, which saw the Chetwynd yard engines make the ten mile trip to and from the mill with boxcars and tank cars twice a week. On March 20, 1993, the station and freight shed at Dawson Creek was destroyed by fire, and they were not replaced. Shortly afterwards, the station and freight shed at Chetwynd were demolished due to structural deterioration. Towards the end of the decade, the CN closed its line from Hythe to Dawson Creek. In June 1999 BC Rail entered into a reciprocal access agreement which allowed the railway to service the numerous online industries formerly served by CN at Dawson Creek. The increased switching reponsibilities led to the establishment of a regular Dawson Creek yard job in 1999, and a CRS-20 and slug were stationed there for this purpose. As the Dawson Creek Subdivision entered the new millenium, its trains were longer and heavier than ever. In 2001 Louis Dreyfus completed a huge 20,000 metric tonne grain elevator on the west side of the tracks at Dawson Creek, and the Louisiana Pacific plants at Perry and Dawson Creek continued to operate. The Alberta Wheat Pool No. 3 elevator is operated today by its successor Agricore United, and the former United Grain Growers seed plant now belongs to Pickseed Canada. Motive Power on the branch line now consisted of modern General Electric B36-7 and B39-8E locomotives. BC Rail passed into history at midnight on July 14, 2004. As part of its agreement to assume ownership and operation of the railway, CN committed to reopening its line from Hythe to Dawson Creek, and this was achieved in 2005. With the former BCR and NAR rail lines into Dawson Creek now under single ownership, the prospect for development of increased through traffic is favourable.